ANG's diagram of Chottie's Plaid is drawn from Chottie's own information. UPDATE: Sorry, ANG has totally cut off access to their Stitch of the Month diagrams except for 2017's information. You can only see this if you are an ANG member. This is totally crazy in my opinion. How on earth do you recruit new members if you don't let anyone see what you offer?! If you are an ANG member or potential member and would like to protest this, you may email ANG's management company here. There doesn't appear to be any way of contacting ANG's officers directly. What you are doing is filling an area in skip tent stitch using the colors you want for your plaid. Let's say you want a blue and orange checkerboard effect with a thin black dividing line between the two main colors of blue and orange. Then you will do 7 rows of blue, one row of black, 7 rows of orange and one of black, then work 7 blue rows again and repeat the sequence until the area is covered with skip tent. You may find Donna's Halloween spider plaid fun. This makes a really fun teaching project for kids who want to master the tent stitch. They can pick their color and numbers, then fill in a shape that can be made up into a quick ornament or coaster if you use plastic canvas and glue felt on the back side. Copyright October 9, 2017 Jane M. Wood. All rights reserved. Happy Thanksgiving, everyone! 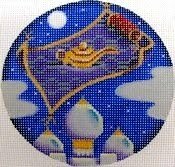 As always I am grateful for all my needlepoint friends. 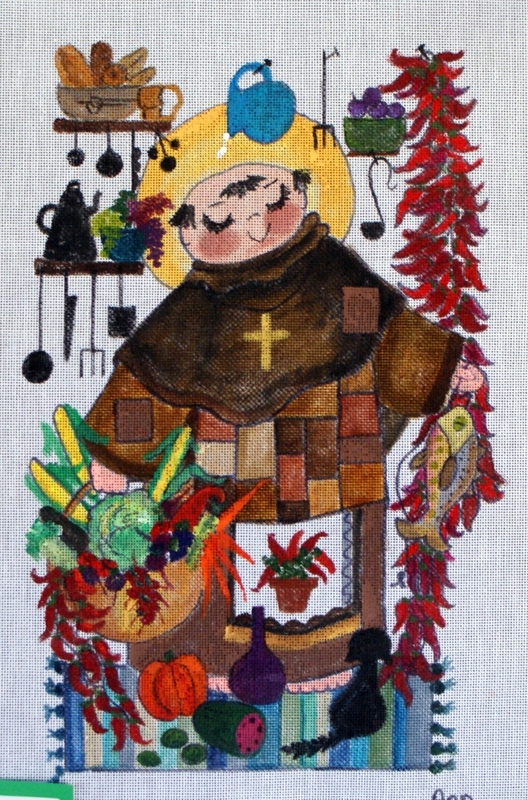 I hope you have a stress free day, full of good food, happy people, and of course a little stitching time. © Copyright November 22, 2017 Jane M. Wood. All rights reserved. Not that long ago a friend [Hi, SL!] told me about Cosmo, a six ply Japanese cotton floss, which she said is very silky to stitch with, and which comes in an amazing range of shades of color. She also told me I could buy it at a quilt shop over the mountain from my house. So when I needed to take the dog to the vet's offices only a short distance from the quilt shop, I made a visit. 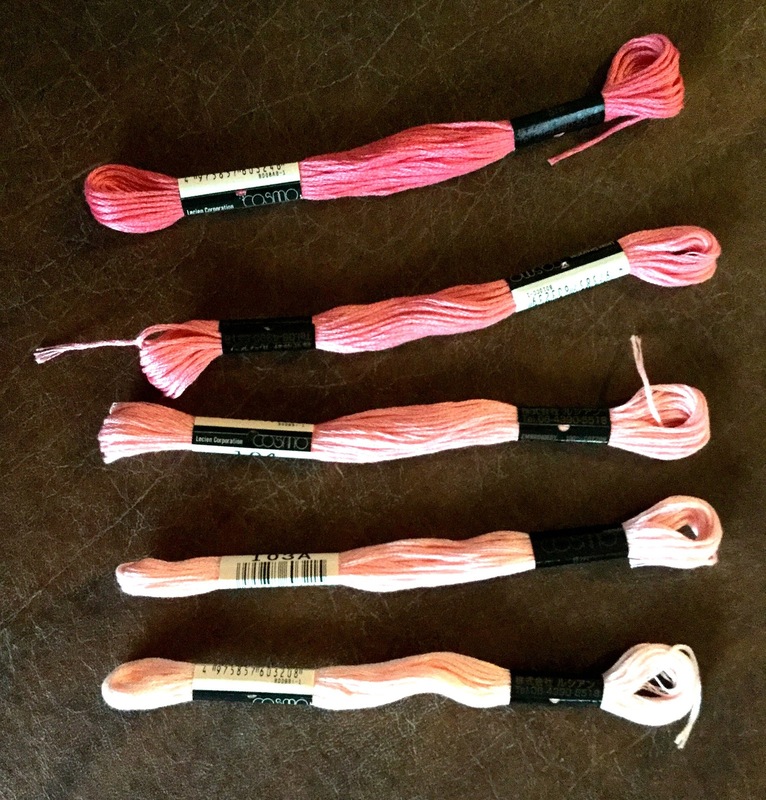 This is what I bought--six skeins of shades of pink. The quilt shop sells them for $1.10 each so I ended up paying $5.83 since I have to pay state tax as well. The amazing thing was that there were at least 15-20 shades of pink to choose from! Plus Cosmo comes in variegated colors. This is great news for those looking for a huge range of one color for designs like Patricia Spence's "Twister"which requires seven shades of one color. I found a bit more about the thread plus a DMC conversion chart here. 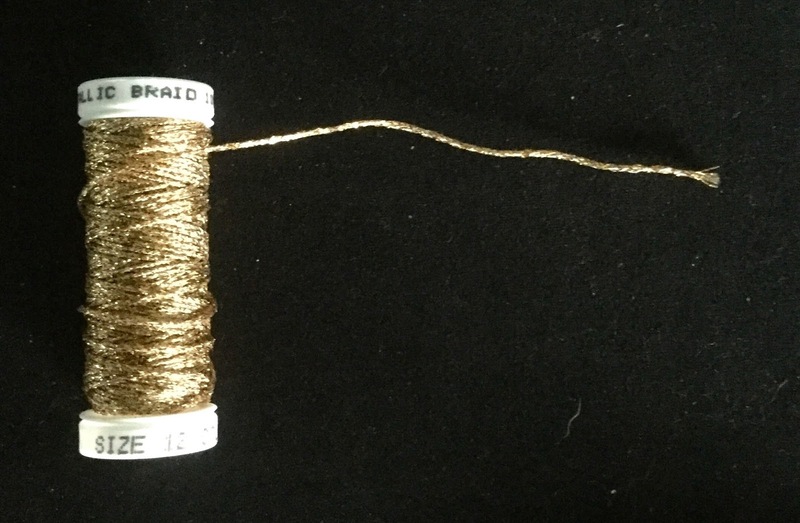 According to this website, Cosmo has a small metallic thread line called Sparkles. This I haven't seen. I've stitched with my Cosmo floss several times since then and find it very high quality. The color range is amazing (although not every color has as many variations as the reds, blues, and purples). 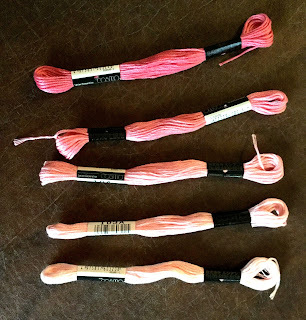 I think if you are stitching something that needs lots of shades like the seven shades required for Twister, this is the thread to use. © Copyright January 17, 2017 Jane M. Wood. All rights reserved. Melissa Prince just posted the story behind her signature blue and white pumpkins on her Facebook page. Fun! If you aren't familiar with her pumpkins, check her website to see them in person. I'm sorry to say that the rumor going around that the designer Curtis Boehringer has died is true. Apparently his sister announced his death on November 17th on her Facebook page without any details except for his passing. My condolences to his family. © Copyright November 21, 2017 Jane M. Wood. All rights reserved. Need a Beach Tote for the Stitching? Bohicket Road is starting a Kickstarter fund raiser. If you love their craft and travel organizers, you might be interested in this. Thanks for letting me know, Susan! Folks who live in Great Britain or who prefer trestle style frames will want to read what Kathy at The Unbroken Thread has to say about the new trestle stands from M.R. S. Embroidery. Trestle floor frames are made to lay your stretcher bars flat on top, then stitch with both hands, one above and one below the needlework. These look solid and they easily come apart to be stored flat against a wall, under a bed, or behind furniture. Nice job, Magda! UPDATE: The shop has a Facebook page (complete with a photo of the elf who makes the frames-LOL) and will have a review from An Unbroken Thread shortly! Stay tuned…. Here's a glimpse behind the scenes while we wait for Kathy to play with her new frame and write a review. UPDATE #2: Kathy's review~ Now I want some! © Copyright November 30, 2016 Jane M. Wood. All rights reserved. 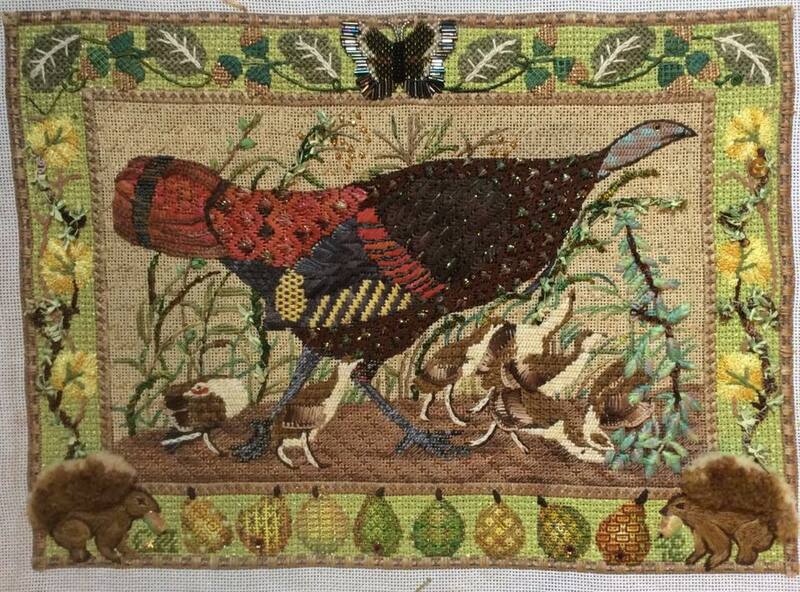 Today I'm really envious of Robin King who got to visit Quail Run Needlework in Scottsdale, Arizona. Actually, I'm envious of the folks in her class, too! Robin is very inspiring and inventive. Then Robin made a stop at Atlanta's Nimble Needle, to teach and of course do a little tour of the shop. Fun! Of course we can always visit the shop websitse and Robin's stitch guides will be available to all of us shortly. Don't you wish Robin needed us to carry her luggage or something?! There's a new designer in town! Meet Anne Fisher. She does classic designs. Pour a cup of your morning (or evening) beverage and watch the slide show! Ruth has announced the Christmas mystery class at Bedecked and Beadazzled— Brooke Connor's "Holiday Owls." The class starts in December. As always, I'll update this article as Ruth posts updates on the various class lessons. Ruth started with the little owl faces and the purple vest. The second lesson Ruth tackled feathers in an unexpected way (and stitched the pink hat, which I want to wear!). The third lesson adds wings and a hat. One more lesson to go! And the final touches are beaded ivy and pompoms, not to mention snowflakes in the background! UPDATE: Here are four versions, all finished differently. Scrim Needlepoint's Facebook account had two celebrity needlepointer mentions today. First up, Martha Washington! Velona Needlecraft in California stocks issues of old needlepoint magazines like Needlepoint News and Needlepoint Plus, but copies of ANG's Needle Pointers and the current magazine Needlepoint Now. They are quite expensive but if the back issue you want is no longer available from Needlepoint Now or ANG, or you want one of the issues from the defunct Needlepoint News/Plus, this is a good place to check if eBay searches aren't turning up the one you need. November's Smart Cookie Award goes to Beverly, who used custom leather pet name tags with her family Christmas stockings. Beverly has her initials and the date and the recipient's initials put on a tag and stitched inside the stocking. Discrete but durable and a very clever use of these little name tags. 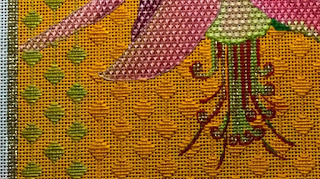 Kreinik has posted a short little video interview with Jude of Jude Designs on their Facebook page. Here is Jude's website. It is THE place to find New Orleans and Cajun-themed designs but there is a lot more, like the new football stadium series. 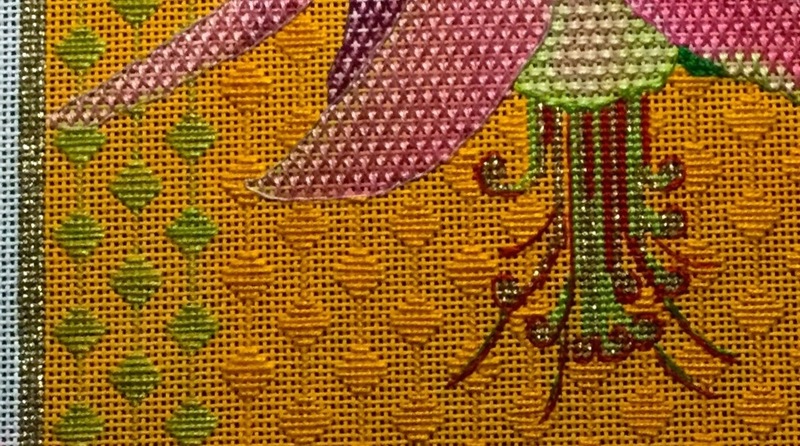 The All Saints' Episcopal Church in Rehoboth Beach has needlepoint kneelers that were stitched by members over the 1970s-80s. The article has a lot of photographs of the pieces that are still in use although who stitched what has been lost. Needlepointers come and go but their work lives on. 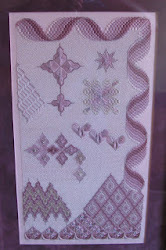 Sandy Arthur has started adding little tips about stitching to her blog updates of current and upcoming classes. That's very welcome as Sandy is a smart and experienced teacher. particularly as this time she is talking about compensation which gives stitchers fits at times. Thanks, Sandy! 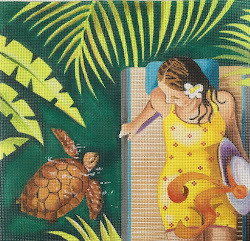 Barefoot Needlepoint Designs has their new website ready! When you click on various categories, don't miss reading "The Story Behind the Canvas" at the bottom of some sections. The site isn't completely done, so remember to visit again in a month or so. © Copyright November 2, 2017 Jane M. Wood. All rights reserved. Jinny Barney interviews Amy Poore from A Poore Girl Paints on her blog today. Her cheerful and modern designs can be ogled at her website. Keep clicking "Show More" at the bottom of the photo gallery to see everything. UPDATE: FiberTalk did a podcast interview with Amy that is a fun look into her design process.